Subscribe on your phone or e-device using your favorite podcast app. Grind Pulp Podcast is available through itunes and direct download. Make way for the Impalers as Andrew Crevier and Jeronimo Brown get their hands dirty with chain grease and sacred blood. We talk three biker short stories and our feature film, “Dear God No!” A mountain of coke can’t get in our way. 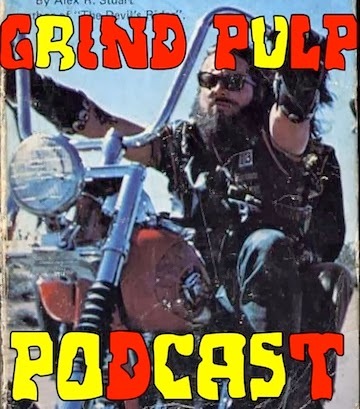 This is Grind Pulp Podcast! Get ready to run for cover as we lay waste to doomsday dickwads with napalm ejectors and plasma grenades. Check back soon for free ski-ball tickets redeemable for your favorite Slurpie. Lawn Jarts and an IROC-Z competition will held for all survivors of the Octopolypse.